You are currently browsing articles tagged train paris versailles. See also ParisByTrain Article: Paris to Chateau Versailles Walkthrough. From Paris you can take a suburban “RER C” train to within 5 minutes walk of Chateau Versailles, ending at station Versailles-Rive Gauche. 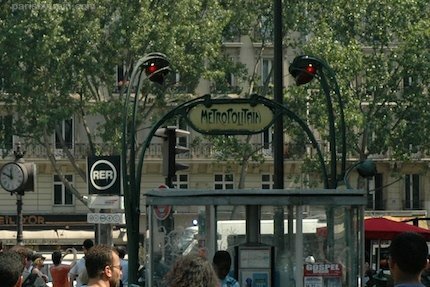 Start your trip by going into any metro/RER station that you find around the city, which will be marked with a blue sign with an M or RER surrounded by a circle. From time to time you’ll see the metro marked only by the old style art deco Metropolitan signs. Take note of the station name when inside. Your goal is to get to the RER C line, the yellow line that serves the western half of the Parisian suburbs. If you’ve got a day or week pass that’s good for at least Zone 4, skip this paragraph, else visit a ticket window in the station to purchase special ticket, since Versailles is in Zone 4, outside the coverage of normal Paris Metro/Bus/RER Ticket t that you would get for traveling within Paris. At the ticket window or guichet [Gee-Shay] don’t panic. There’s a 50/50 chance the worker will speak English quite well and if not, they’ll understand “Chateau Versailles” [Shah-Tow Vher-Sigh]. Normally the metro worker will ask you whether you want a return ticket, by asking “Aller Rétour?” [Alleh-Ray-Tour] (or by making hand signs), which is simply two of the single tickets. Each ticket is currently () or double that for a return trip. Tip: don’t expect that your credit card will work at the ticket window. Many North American credit cards will simply not work at RATP/SNCF credit card machines so have cash on hand and don’t expect to use that 50 euro note either. Small bills or coins are best. Go ahead and buy Aller-Rétour return tickets to save a bit of time (unless you plan on sneaking off the tour path at the chateau and spending the night there). Once past the turnstiles find the Metro map or plan [plon] to see where you are in relation to the yellow RER C line. If you happen to be at St. Michel/Notre Dame, Tour Eiffel (plus a few others) you’re already on the RER C line, all you need to do is find the right train platform. Many stations throughout Paris serve several different metro lines and RER train lines all within the same station. This means a single station can have several vertical levels plus many different platforms going in opposite directions. This may sound confusing, but it follows a pattern that you’ll quickly master: All RER lines are letters, A to E, all Metro lines are numbers 1 to 14. All lines have a terminus station, i.e. the last station on the line. Every train and metro platform will mark which line you’re on and which direction the train is going, which is the terminus station. If you are not already at a station which serves the RER C line, play snakes and ladders with the metro/RER lines on the map to see how you can get to the closest RER C station. Once you’re at an RER C station, follow the overhead signs and wall signs towards the RER C Versailles-Rive Gauche platform. What may be confusing is that there may be other names on the sign along with Versailles-Rive Gauche for other terminus stations along the same line. For example, you may see an RER C sign that shows the direction/terminus station as Saint-Quentin-en-Yvelines, Versailles-Chantiers, Versailles-Rive Gauche, all on one sign. As long as the terminus station is not before the station you want (in this case Versailles-Rive Gauche), you can take the line since it’s going in the right direction. Once you’ve arrived at the RER platform you’ll see overhead signs along side the rails which show a plethora of station names, each possibly lit with a yellow square before the name. If the name is marked with a yellow square, the next train that arrives will stop at that station. Look for the station that you want, Versailles-Rive Gauche. If the name is not on the board, check the other side of the platform, which is going in the opposite direction. When the train arrives, the doors will not open automatically; Someone on the train, or you, must press the green or silver button on the door to open it. Once on the train, if you’ve taken the right train, you won’t need to keep track of the stations since Versailles-Rive Gauche will be the last station on the line and everyone will be getting off. After arriving at the terminus station, look for blue “Sortie” signs which mark exits for the station. Eventually each of them will have a name marking what street it gives access to. On occasion a landmark or sight such as Tour Eiffel or Chateau Versailles will be marked on the exit sign as well, highlighted in beige. Pick an exit and look out for brown street signs pointing in the direction of the Chateau. With any luck, you’ll find one for Chateau Versailles, which is just a five minute walk from this station. Enjoy your visit.